Andy Cash started work at Inferno Records, which would later become Tempest record shop, in Birmingham before moving to EMI as a rep in 1978. Andy then opened his first shop in 1980 at 596 Kingsbury Rd, Erdington and went on to open two more shops at 677 Kingstanding Rd, Kingstanding and 115 Harborne High Street, Harborne. I have some vinyl records which I’m thinking of selling but unsure how much some of them are worth, we have looked on the internet and found out a few prices but we are unsure if this information is correct. My daughters friend told us to contact yourself as you may be able to help us. Never forget the Saturday afternoon’s in the late 80’s spent at Andy Cash records in Kingstanding. Whatever tune I’d heard in the clubs (Dome, Edwards no 7, Pagoda Park) he would always have the 12″ in stock. Still have my old vinyl now in a box, corner of the garage – too many fond memories to let it go. Pocket money well spent. 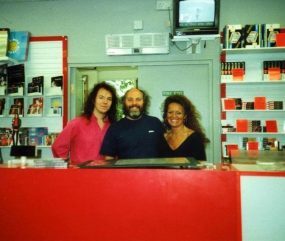 I used to work at jaguar, and on Saturday morning after O/T I’d nip up to Andy Cash Records…who was the guy with the beard in the above pic, was it Rob? Anyway I nearly always dealt with him, he used to order all my thrash metal and I’d collect it the week after. Still got all those albums too!